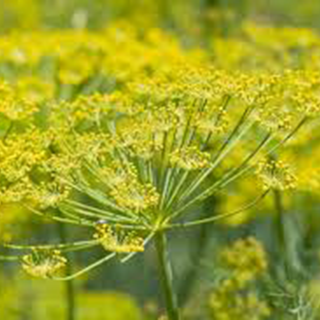 Cultivated as both an herb and a vegetable since Roman times, fennel originated in Mediterranean areas, but by the 8th century AD had spread to northern Europe. It is widely available as an after-dinner herbal drink in teabags to improve digestion, and has been used as a culinary herb with fish for centuries. Fennel seeds' longstanding reputation as a weight loss aid is probably due to its diuretic properties, but it will not contribute to the long-term loss of fat cells. Fennel is known for its cleansing, clarifying flavour that helps reset taste buds and reduce cravings. The tincture or tea synergies well with laxatives, acting as an antispasmodic. The herb is completely safe for infants and will almost always relieve colic when administered as a weak tea by the teaspoonful (5ml). Alternatively the mother can take the extract or drink the tea. 1/2–1 tsp of seeds to 1 cup of boiling water as an after-dinner tea to combat gas and indigestion. A standard infusion taken 3 times daily can increase milk flow when breastfeeding. Use 1 cup of above infusion of seeds as a wash for gum disorders or a gargle for sore throats. 5–10 drops (1/4–1/2ml) as a remedy for constipation to combat griping pains. Drink 1 cup (1 tsp dry root per cup boiling water) 3 times daily for disorders linked to high uric acid levels. Add 5–10 drops (1/4–1/2ml) each of fennel, thyme, and eucalyptus essential oil to 4 tsp (20ml) of almond oil and massage into the chest for coughs and bronchitis. Sow fennel seeds where you want them to grow in spring and thin to 12in (30cm), or transplant self-sown seedlings. Generally fairly hardy, but may suffer in severe winters. Can be treated as a biennial. The dulce variety is grown as a vegetable. Collect the leaves in summer and the seeds in autumn. Lift the root, if using, once the leaves have died down.